Review Context: I’ve played every Assassin’s Creed upon release, excluding the side games like Assassin’s Creed Freedom Cry and Assassin’s Creed Liberation. First and foremost, forget that Assassin’s Creed Unity ever happened. It holds no impact and in no way represents what Assassin’s Creed Rogue is. That being said, Rogue is essentially Assassin’s Creed IV Black Flag 2; what Assassin’s Creed: Brotherhood was for Assassin’s Creed 2. So I will be comparing improvements from Assassin’s Creed IV Black Flag and from the other entries in the series. If you’ve played Black Flag before you can go ahead and skip the rest of this paragraph. 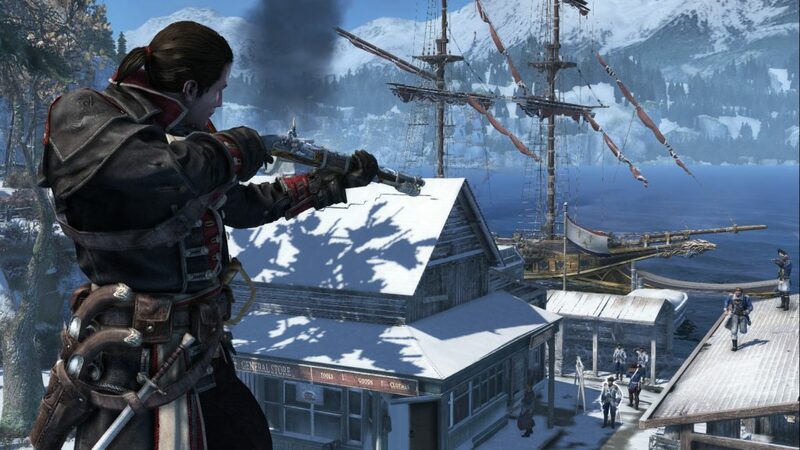 Assassin’s Creed Rogue is an open world, 3rd-person stealth action/parkour game where you hide in bushes, run along rooftops, clash swords, and most importantly, stab people. Once you’ve grabbed all the collectibles and stabbed all the people, you can take to the seas on your ship where you can engage in thrilling naval combat as you sail to new destinations, new challenges, and maybe even some answers. In order for a series to have this many installments, the developers have to be improving the formula regularly. Games that are predominantly single-player cannot rely on the desire to play online to pump out carbon copies every other year. Things need to change or be upgraded and so far every assassin’s creed has done so in one way or another. Assassin’s Creed 2 fixed Assassin’s Creed’‘s problem of painfully repetitive missions. 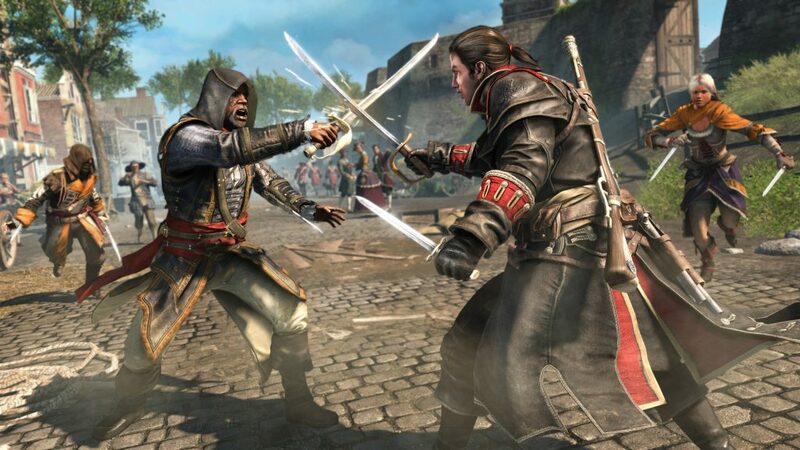 Assassin’s Creed 3 revamped the combat to make it more fast paced and exciting, relying less on blocking and waiting for a parry and instead incentivising attacking and parrying mid-combo. But the problem with Assassin’s Creed 3 was that revolutionary era Boston was really boring to run around. No tall buildings, streets too far to leap across, lots of boring fields, and forests that all look the same. With Black Flag came the addition of sailing from island to island, allowing the developers to break up the play areas into more defined and condensed segments. By Assassin’s Creed 3 we had a lot of fun things to play with: cool tools, new ways to parkour, and (of course) various methods to hide and kill people. But since the developers were tasked with making a realistic Boston and frontier, they weren’t able to give the missions that took place there any flow or engaging design. They had to choose historical accuracy over game design. But since the world of Black Flag is broken up into many islands, the developers can craft missions specific to the area and essentially create arenas for events to play out in that still feel natural and real. Rather than cramming the content into a confined space where everything has to look a certain way, they could focus on specific segments to make them more interesting and fun. This to me was why Black Flag was my absolute favorite and, in my opinion, best Assassin’s Creed game yet. Assassin’s Creed Rogue is a perfect sequel, taking elements from all the previous Assassin’s Creed games, expanding on the vast improvements they already made with Black Flag, and adding some new and fresh features to boot. Rogue is about an assassin named Shay who finds fault in the ways of the Brotherhood and is taken in by a friendly Templar who starts Shay on his path to becoming an assassin hunter. Its very interesting, after six games of being an assassin, to see things from the other side. It’s not the longest story, but that does not mean there is a shortage of gameplay. While I personally have lost interest in the precursor story and all the fancy lore bits, its all there. The hidden messages, the lost interviews, and the references to previous titles all tell a story that is rather large and very well done. The data pieces are well acted, believable, and interesting, yet, at the same time, are totally optional. The story is certainly nice, but being able to ignore it and play if I want to is a feature that is frustratingly often missing. Rogue does an exceptional job of eliminating down time. You can fast travel to your ship, any viewpoint, and island at any time. Say there are two collectibles on opposite sides of the island, you don’t have to run to one side and then all the way back. You can just fast travel back to the nearest viewpoint on the island. The load times are so short that this a welcomed convenience, especially when there is just so much to collect and do. My favorite thing about Rogue was that, since you’re an assassin hunter, they added new assassin enemies that like to jump from bushes and pounce on you from rooftops. They even added the enemy range indicator introduced earlier in the Assassin’s Creed: Brotherhood multiplayer so that you can figure out where you’re going to get jumped from. The best though are the assassin captains. These are truly difficult enemies that need to either be out-tricked or out-gunned. They are much harder to get the drop on than normal guards and when confronted are capable of throwing knives and escaping easily. Assassin’s Creed games have always fallen short on difficulty. Guards are just too easy to kill, but in Rogue these enemies are sure to spice things up and even catch you off guard now and then. I can’t confirm this, but it feels like they lowered the amount of time you have to make a parry also, which is great for a seasoned Assassin’s Creed veteran such as myself. On top of all that, the money/resources economy system and crafting progression are used to make everything feel worth doing. The rewards are balanced to feel meaningful, based on the effort required, and there is never a lack of things to spend it on. There are plenty of challenges and side missions to keep you using all the game has to offer. Lastly, and most thankfully, the PC version runs very solidly. Since Rogue is actually still a 7th Gen game and not on the Playstation 4 or Xbox One, it doesn’t look amazing by comparison. However this gives it low requirements allowing it to run on PC very easily with quick load times and smooth frame rates, all while looking more than pleasing to the eye. Playing games like these with a keyboard and mouse can be rather clunky so I used a game pad. The game feels just like it did in Black Flag, smooth yet slightly over precise. 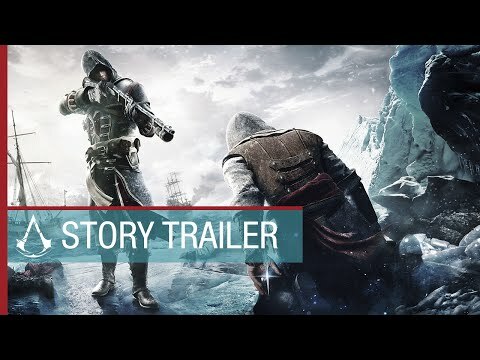 All in all, I think Assassin’s Creed Rogue is the best Assassin’s Creed to date. Assassin’s Creed has never felt so good, and boy is it good.